Fundamentally, the overall look was European. 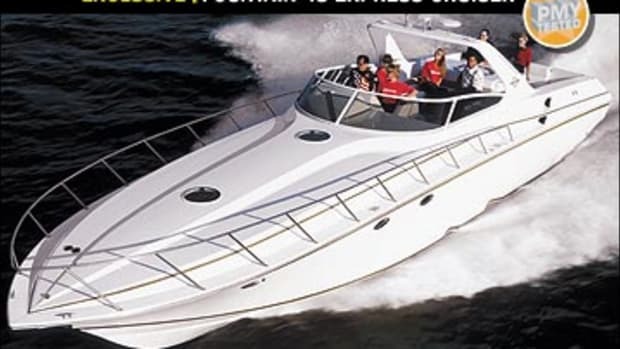 But in addition to that, the Cruisers design team had apparently decided to toss in some two-fisted boldness too, augmenting the creamy Euro-curves of the boat’s profile with a complex array of aggressive—you might even say pugnacious—style lines. The result reminded me of the new BMWs—lots of panache and chutzpah in one package. And there was another bit of niftiness as well. As the 48 began backing down, I noted the total absence of canvas! 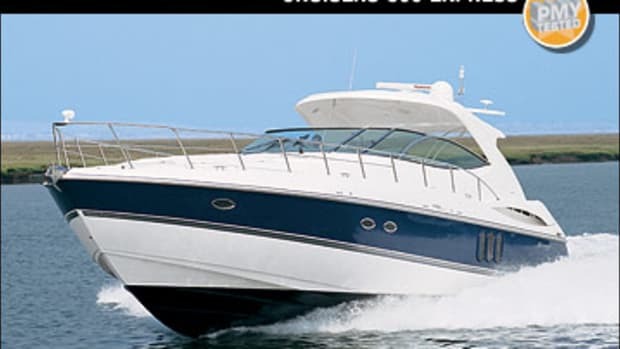 Apparently, you could cruise this baby all day, give her raked all-glass-and-fiberglass enclosure a spritz at nightfall, and be done with it. No intransigent snaps. No zippers. No nothin’ to fool with. The boat’s interior was just as chic and, if anything, even more radical than the exterior in terms of design. Upon entering from the cockpit via a big Taylor Made tri-slider, my immediate impression was one of total modernity, thanks to a darkly stained hardwood deck, the distinctively thick countertops of gray Swanstone composite, and a futuristic pod-type instrument panel hovering like a spaceship over the starboard-side steering station, all arrayed against a backdrop of white fiberglass and UltraLeather upholstery. The revolutionary nature of the layout manifested itself as I went forward. Simply put, it juxtaposes two saloons on two different levels via an expansive, entirely open stairwell. 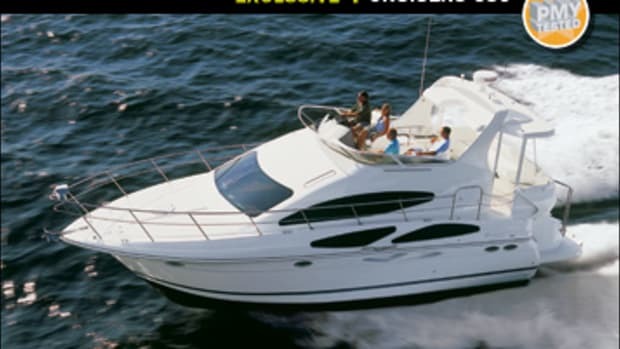 The upper saloon on the main deck offers the helm station, an entertainment center, and wet bar to starboard, and a dinette-table-equipped U-shape sofa to port. The lower saloon on the bottom deck puts a galley to port, an L-shape sofa to starboard, a full-beam master aft and a VIP forward. Not only does such an innovative arrangement incorporate virtually all aspects of the interior into one giant, socially connected living space, it also provides lots of ambient light below, thanks to the greenhouse effect produced by the windshield and sunroof overhead. 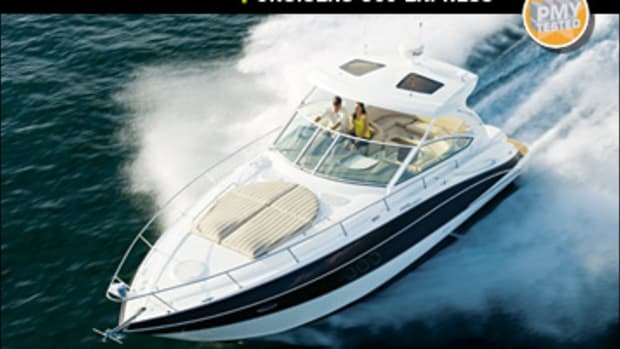 “Sorta like a split-level great room with big skylights,” I synopsized to a Cruisers guy onboard. 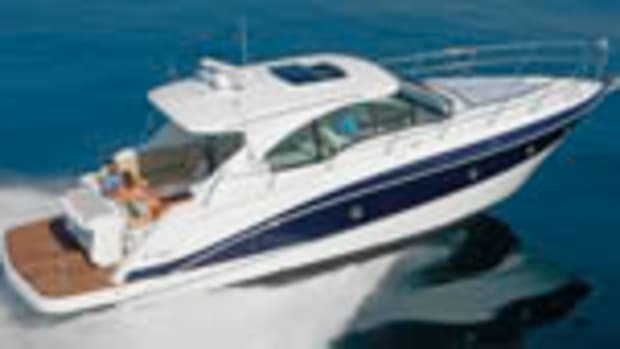 Easing the Volvo Penta IPS-energized 48 out of her slip was a morceau de gteau, as the French-Canadian side of my family used to say, despite a stiff crosswind pummeling the starboard side. Out on Green Bay, sea conditions were a tad sporty, to say the least, with seas cresting to five feet and the wind gusting to 20 mph and higher. Still, the 48 acquitted herself with assurance and produced a solid top speed of 38 mph. 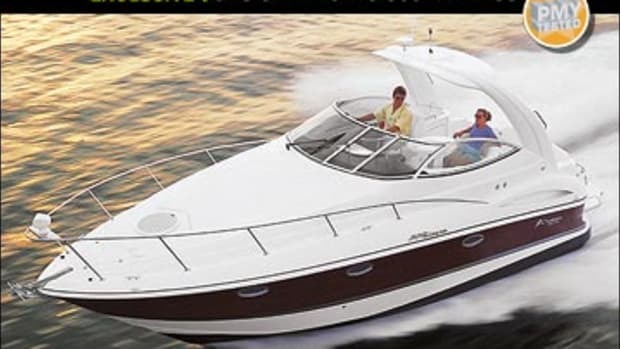 Turning was tight, the ride dry, and visibility from the helm was 360-degree superb, due to the immensity of the windshield’s panels, side windows, and triple slider aft. I also found the interplay between the latest iteration of Volvo Penta’s Electronic Vessel Control system (EVC) and Volvo Penta’s new binnacle-type, single-lever electronic engine control (with troll mode, single-lever option, and other functions) to be just as straight-forward and user-friendly as the earlier, simpler versions. Emboldened by the 48’s radical-chic good looks, I docked her with what I hoped was a little flair. Instead of stopping to pivot the boat slightly upwind of her slip (in order to obviate the effects of wind-related drift), I put the brakes on downwind of the slip by a couple of boat lengths, thereby engendering a situation that demanded I walk the 48 sideways for a significant distance while fighting against 15-to-20-mph zephyrs. I drew two conclusions from the exercise. 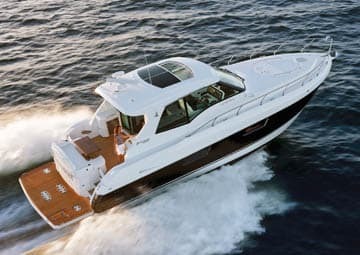 First, the 48’s IPS600 propulsion package is ample—she muscled her way up the little channel as if the wind weren’t blowing at all. And second, thanks to the relative height of the deck undergirding the helm station (as well as the abundance of encompassing glass), the vessel’s docking visibility is simply extraordinary. While I was manipulating the 48’s Volvo joystick—Cruisers thoughtfully positions it far enough away from the steering station’s starboard inwale so a right-handed skipper doesn’t have to struggle to reach behind his or her back while facing aft—I could effortlessly keep tabs on everything, both onboard and dockside. Checking out the 48’s engine room, reached via a cockpit hatch and ladder, was my last undertaking of the day. 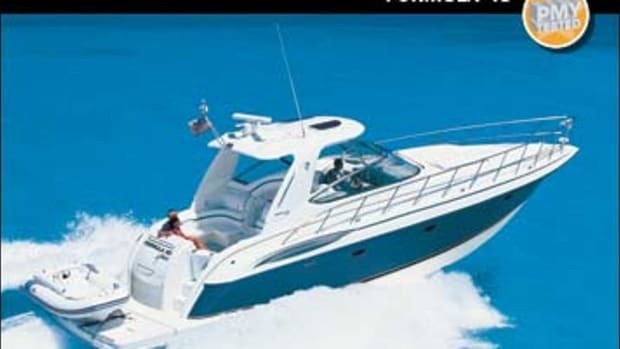 The place was huge, with headroom of 5&apos;6" and a 2&apos;9" walkway between our optional 435-mhp Volvo Penta IPS600s. Access to these engines as well as their associated pod-drive units was unencumbered, as was access to the batteries, genset, and water heater. Soundown insulation evident throughout and the schematic configuration of the electrics was pure Made-in-the-USA loveliness. 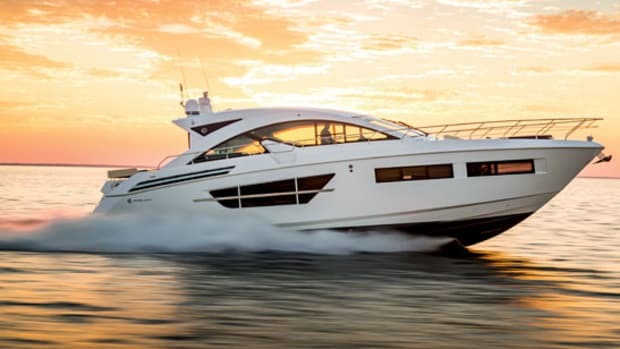 A niggling question came to mind as I departed the Cruisers 48 Cantius Sport Coupe, one of the most stylish, innovatively arranged, and easily maneuvered vessels I’ve tested in several years. 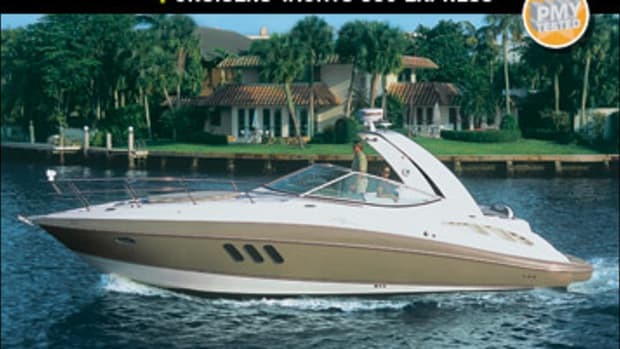 From whence the name: Cantius? 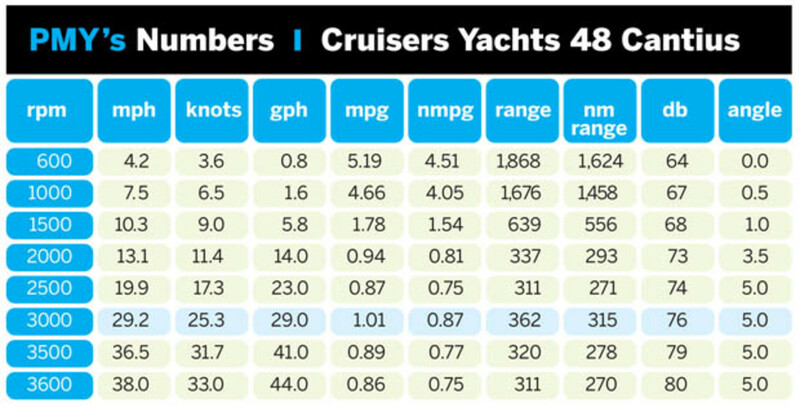 This article originally appeared in the December 2010 issue of Power & Motoryacht magazine.